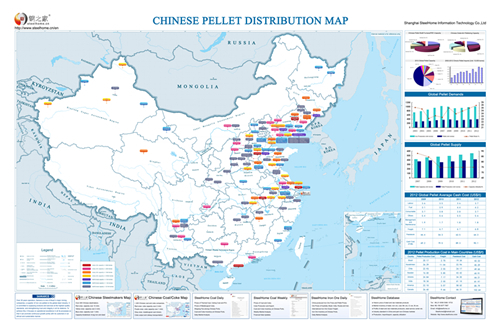 SteelHome has printed out Chinese Pellet Mines Map. Below is the silhouette of the map, which includes around 150 pellet mines in China. On the right hand of the map, you can also find valuable data, such as Chinese pellet shaft furnace capacity breakdown, global pellet capacity breakdown, Chinese pellet import, global pellet demand and supply, global pellet cost etc. The combined capacity of 150 mines on the map is 180 million tonnes, versus total 220 million tonnes in the country. Delivery: SteelHome can mail the map to you.